All statistics correct as of 2 May 2015. The 2014–15 Football League Two (referred to as the Sky Bet League Two for sponsorship reasons) was the 11th season of the Football League Two under its current title and the 23rd season under its current league division format. The season began on 9 August 2014. Twenty four clubs participated, eighteen of which remained in League Two having been neither promoted nor relegated at the end of the 2013–14 season. 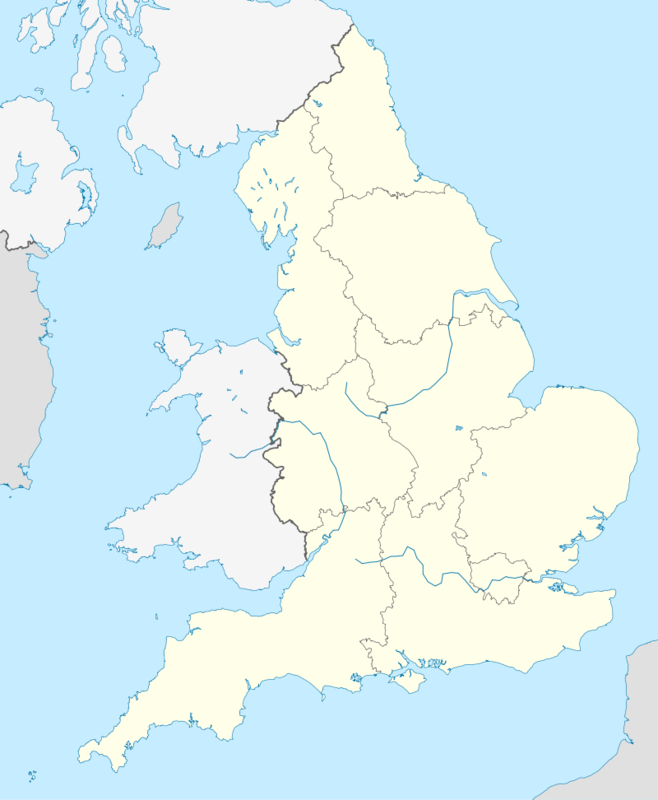 These clubs were joined by Tranmere Rovers, Carlisle United, Shrewsbury Town and Stevenage who were relegated from 2013–14 Football League One, and by Luton Town and Cambridge United who were both promoted from the 2013–14 Football Conference. Burton Albion won the League Two title after a 3-2 away to Cambridge United on 2 May. The following teams changed division at the end of the 2013–14 season. Updated to games played on 25 April 2015. 1 2 3 4 "English League Two 2014–15". statto.com. Retrieved 18 February 2015. 1 2 3 4 "English League Two Statistics". ESPN FC. Entertainment and Sports Programming Network (ESPN). Retrieved 25 February 2015. ↑ "Cambridge 2 Burton 3". BBC Sport. 2 May 2015. Retrieved 1 October 2015. ↑ "League Two round-up: Jimmy Floyd Hasselbaink's Burton complete stunning comeback win to claim title". Daily Mail. 2 May 2015. Retrieved 1 October 2015. ↑ "Ups and Downs". BBC Sport. Retrieved 21 April 2014. 1 2 "Oxford United: Michael Appleton named head coach in shake-up". BBC Sport. 4 July 2014. ↑ "Carlisle United dismiss manager Graham Kavanagh". BBC Sport. 1 September 2014. ↑ "Keith Curle: Carlisle name ex-England defender as manager". BBC Sport. 19 September 2014. ↑ "James Beattie: Accrington Stanley part company with boss". BBC Sport. 12 September 2014. ↑ "Accrington Stanley: John Coleman returns as manager". BBC Sport. 18 September 2014. ↑ "Hartlepool United: Colin Cooper resigns as manager". BBC Sport. 4 October 2014. ↑ "Paul Murray: Hartlepool United appoint ex-player as manager". BBC Sport. 23 October 2014. ↑ "Rob Edwards: Tranmere Rovers sack manager after five months". BBC Sport. 13 October 2014. ↑ "Micky Adams: Tranmere Rovers appoint ex-Port Vale manager". BBC Sport. 16 October 2014. ↑ "Nigel Worthington resigns as York City manager". BBC Sport. 13 October 2014. ↑ "Russ Wilcox: York City name ex-Scunthorpe boss as manager". BBC Sport. 15 October 2014. ↑ "Gary Rowett: Birmingham City appoint Burton boss as manager". BBC Sport. 27 October 2014. ↑ "Jimmy Floyd Hasselbaink named as Burton Albion manager". BBC Sport. 13 November 2014. ↑ "Paul Cox targets new challenge after parting with Mansfield". BBC Sport. 21 November 2014. ↑ "Adam Murray: Mansfield Town name midfielder player-manager". BBC Sport. 5 December 2014. ↑ "Mark Yates: Cheltenham Town sack manager". BBC Sport. 25 November 2014. ↑ "Paul Buckle: Cheltenham appoint ex-Bristol Rovers and Luton boss". BBC Sport. 26 November 2014. ↑ "Paul Murray: Hartlepool sack manager after FA Cup defeat". BBC Sport. 6 December 2014. ↑ "Ronnie Moore: Hartlepool United appoint ex-Rotherham manager". BBC Sport. 16 December 2014. ↑ "Justin Edinburgh: Gillingham appoint Newport boss as manager". BBC Sport. 7 February 2015. ↑ "Terry Butcher appointed new manager of Newport County". BBC Sport. 30 April 2015. ↑ "Paul Buckle: Cheltenham Town boss leaves after 79 days at helm". BBC Sport. 13 February 2015. ↑ "Gary Johnson: Cheltenham Town appoint manager for rest of season". BBC Sport. 30 March 2015. Retrieved 30 March 2015. ↑ "Andy Awford: Portsmouth manager steps down from role". BBC Sport. 13 April 2015. Retrieved 13 April 2015. ↑ "Paul Cook: Portsmouth appoint Chesterfield boss as manager". BBC Sport. 12 May 2015. Retrieved 12 May 2015. ↑ "Micky Adams: Tranmere Rovers part company with manager". BBC Sport. 19 April 2015. Retrieved 19 April 2015. ↑ "Gary Brabin: Tranmere Rovers appoint new manager". BBC Sport. 5 May 2015. Retrieved 5 May 2015. ↑ "League Two Top Scorers". 27 September 2014. Retrieved 27 September 2014.